Purpose: Inclusive education, widely acknowledged as an alternative method of making education accessible to children with special needs, has been piloted for 10 years in selected districts of Ghana. 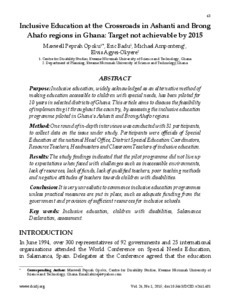 This article aims to discuss the feasibility of implementing it throughout the country, by assessing the inclusive education programme piloted in Ghana’s Ashanti and BrongAhafo regions. Method: One round of in-depth interviews was conducted with 31 participants, to collect data on the issue under study. Participants were officials of Special Education at the national Head Office, District Special Education Coordinators, Resource Teachers, Headmasters and Classroom Teachers of inclusive education. Results: The study findings indicated that the pilot programme did not live upto expectations when faced with challenges such as inaccessible environments, lack of resources, lack of funds, lack of qualified teachers, poor teaching methods and negative attitudes of teachers towards children with disabilities. Conclusion: It is very unrealistic to commence inclusive education programmes unless practical measures are put in place, such as adequate funding from the government and provision of sufficient resources for inclusive schools.